Today, I’m posting a little differently, and it’s something I’m pretty excited about. A new series ready to be kickstarted. One that involves, coffee, cake and some lovely long chats, with some amazing different women, who are doing all kinds of incredible things. There’s always a first though, and today that’s Kelli Donovan from Pure Pod. An ethical clothing company that I’ve held in high esteem after discovering them on instagram a few years ago. For me it’s clothing that I feel ‘me’ in, and I’m tickled pink to have been able to sit down (ok, yes online) and be able to have a lovely long chat about what slow fashion really means, how social media connects consumers and what Kelli’s favourite kind of cake to go with that tea is? Please take a few extra minutes to meet Kelli Donovan through this new series… Conversations with Community. So first up Kelli, we’ll get the serious stuff out of the way first. What sort of tea are you drinking and favourite cake to go with it? I like old fashioned tea with milk, even though I have milk allergies!! Or herbal teas, vanilla is very yummy or any kind of mint is my favourite. My favourite cake is carrot cake! Great, now we have that sorted. I’d love to know more about your company. You run an Australian based ethical fashion label called Pure Pod, can you tell me how Pure Pod got started? We had moved up from Melbourne to the Byron Shire for a tree change in 2005. We needed a break from the fast paced fashion industry and Sean’s commercial photographic industry. I had fallen in love with yoga and it just seemed like the perfect fit for our lives to move from the city to the beach and complete the training as a yoga teacher for almost 7months full time. We started in the Byron Bay hinterland in 2007 on an organic macadamia farm we were living at that time. I had just finished my yoga and pilates teacher training. I was teaching yoga and working as a tea lady at the Lismore Hospital. I had always wanted to do my own organic or natural fibre label and I was inspired by what I saw living in this area and how seeing such ill people in the hospital effected me. I felt lucky to have my health and youth on my side. I felt I should give my dream a crack! Sean was with me all the way and encouraged me to do it. He has been through it all with me in the 10 years of our business – the highs and the lows! I bought our first fabric at the end of 2006, with the last of my savings and when I got it I knew I was on the right path! I opened the doors to our farm house and let the smells of spring come wafting through the house. Put some music on and began pattern making! It was one of the scariest things I have done but so exhilarating! We sold our first whole sale collection into stores in mid 2007. As a consumer it’s not always easy to find everyday clothing items that are both from local companies and from locally made fibres. How hard is it to source those locally made fibres/fabric? Does Australia produce anything in large amounts for the garment trade? It is very hard to find good Australian makers and even harder to find Australian made quality organic fabrics. Our industry is now going through a huge shift as the highly skilled people retire and there is not a new wave of skilled people coming through behind them. There is hardly any textile mills open now in Australia and hardly any textiles grown here. We have always used an Australian organic cotton fabric which is from Fair Trade organic cotton fibre from India and the fabric was made in Melbourne. Most of our other textiles are not made in Australia as there is no textile mills to make them here. Many fabrics come from Asia and India. We have some organic denim from Turkey. Many textile and fashion industry places have closed down in the last 10 -15 years as more and more imports are coming in to Australia. Up to this date we have only used Australian based makers, cutters, pattern makers and printers but this has been harder and harder to compete with offshore products. We have had to change our direction with our new collection which will be fully Certified Fair Trade and Gots Certified organics and made in India. The quality of the textiles and clothing is beautiful. (This collection was launched on the 1st October at Fashfest and launched on line at the end of October.) It will be in stores November. We are very excited about this new product and to be showing our customers soon. We will still make some high end designer unusual pieces in Australia but as we now have only two makers left out of about 10 we have used in the past, we had to look at a different direction to be commercially viable. All of our other makers have retired. It’s been about 3 and half years now since the Rana Plaza disaster in Bangladesh, do you think the industry has changed much since then? There has been a lot of underground movement from this which I think has made it’s way up the fashion ranks to bigger companies and more developed designers. Before the Rana Plaza disaster ethical fashion wasn’t talked about as much as it is now in the media and with makers. Now more and more designers and brands want to change their ways and become more organic and ethical in their production. We still have a huge mountain to climb with fast fashion companies. These companies cause the biggest problems and pollution but slowly over time they are being forced to look at their supply chains and change their ways. Hopefully one day ethics and open clean supply chains will just be the norm in our industry. Pure Pod did a big art installation this year with CIT and Salvo’s for the FASHREV Day. We borrowed from the Salvo’s, white garments in the same the number of people who died in the Rana Plaza disaster. These white garments were folded and installed in my installation with the help of the CIT fashion teachers and students. We showed the True Cost movie and the money raised went to a small group in Cambodia to buy them machinery for their industry school. We often hear about Slow Food and the follow on effect with the Slow Movement, so how does Slow Fashion tie in and what does it mean to you? Many of our customers are sick of fast living – fast food – fast fashion, a fast pace of life which makes us all feel empty and tired. They are looking for something with ethics, meaning and that feels good. Slow and organic food feels good in your body and the way it is grown. So of course the slow fashion movement would inspire people in this way also. Organic and sustainable natural textiles feel amazing on your skin. If they are made with care and ethics it gives the wearer meaning and story behind their purchase. We are all sick of buying cheap clothes that don’t fit well and don’t last a season. They might be cheap but if we add up all the cheap purchases in our wardrobes and mark down how many times we wear them, it would cost much more than a beautifully designed and well made ethical garment that will last years of wear. If you were describing Slow Fashion to someone who had never heard of the term before, what would you say? Beautiful hand made creations which are made with ethics, love, passion and quality. I mostly love meeting other small makers, designers, artists and anyone trying make a better world for our future generations and for our planet. Our new collection is called ‘Awaken’. It is a collection inspired by nature, organics and our botanical artist/florist friend, Lauren Anderson from Field & Coppice. She designed a beautiful art installation at Brow Lab in Braddon and photographed it. We have turned the images into textile prints which are the main statement of our new commercial collection. Pure Pod will have it’s 10th birthday next year and with that thought close to our hearts and minds we are relaunching our brand to the public and into retail stores online and wholesale throughout Australia. We launched our stunning new collection at Fashfest that is fully FAIR TRADE certified, FLO & GOTS Certified. This means that the people and planet involved are in our best interests and the lowest impact on our environment is a key ethic to this collection. Being Fair Trade certified shows our loyalty to those involved with making our clothing are looked after in their health, safety and incomes. We also collaborated at Fashfest with another inspiring Eco artist from the Sunshine Coast, Katie Johnston from EcoBling. EcoBling up cycles waste and turns it into gorgeous eco jewellery. They plant a tree for each piece sold and work with marginalised communities in developing countries to empower people to create an eco-friendly enterprise. They also respond directly to social issues, environmental concerns and natural disasters through creating meaningful and beautiful products. EcoBling is the planet friendly accessory label. I first heard of Pure Pod via Instagram (I couldn’t for the life of me remember who it was, but I am super duper thankful!) Someone was singing your praises and I went off to investigate. How do you think social media plays a part in creating awareness and spreading a fashion message that still feels far too small? Well it’s FAR BIGGER than when we started 9 years ago. There wasn’t such a thing really as social media then. I remember thinking, when we were making our first retail web site, who’s going to buy clothes online? HA well I didn’t even know about social media then! Social media is fantastic because little designers like us can have our own voice and not be waiting for magazines and stores to speak for us. It’s free and we can control our own information and what we want to send out. I connect with lots of like-minded sustainable designers all over the world and people interested in social change, so I think there’s a huge movement out there and I’m really proud to be a part of it. I’d prefer to be part of the solution than part of the problem and just sit back and wait for other people to change things or not care at all. I couldn’t live with myself! In my younger days I would rather fork myself in the eye than spend a day window shopping and buying mass-produced clothing. With the growth of social media, the opportunities for lessons in how to make your own clothing, and buying from people who are more aligned to your values seems easier, and easier. I love being able to chat in a tiny way to the people behind some of my wardrobe, just as I like being able to chat to the people who provide me with the bulk of my food. Those connections are really important to me. How important are those connections to you? Is it possible to pin point where all the items from within your company actually come from? I love talking to all of our customers as we are small. I get to know many of them and they tell me stories of where their Pure Pod clothing goes and is worn. I love it! Maybe as we grow bigger I might not have to time get to know all of our customers but I will make sure our staff treat each one personally and with a huge respect for making a conscious change in their buying habits! Our new Fair Trade Collection called AWAKEN – We can definitely pin point the process and hopefully one day we can go over to India and meet all the people who made it happen for us. Most of our other Australian made collections you can almost pin point the supply chain but it’s a bit harder when the fabric comes from everywhere around the globe. There’s hardly any textiles made here now and sadly many of our beloved makers are retiring. Great for them to have this time but hard for us as we have got to know them all so well and we have to grow with the changes. I’ve always been a die hard Australian made so we have jobs for our industry but it has just become so hard now. The older generation with all the skills are retiring and there’s really not many new people coming through with the same skills and opening making businesses. We will still make some higher end more bespoke pieces here and special items, but our commercial pieces will be made at this amazing place overseas now. I know we are helping the organic cotton farmers and workers in the local region where the fabric and clothes are made so we are elated! Hypothetically (ahem) if you had in general more enthusiasm than sewing skills, but wanted to sew a little something that was wearable. What would you recommend as a starter project? I think I do have more enthusiasm than sewing skills!!! My makers are the ones who make our product look amazing! It would take me forever to make the clothes. The makers have been doing this for many years and are highly skilled. But if you wanted to do something simple try a simple elastic waisted skirt, pants or a square sleeved top. Or if that’s all too scary try a pillow case! Or just come and see me! I will be running workshops next year about sustainable fashion and how to start your own brand! Not that I want to start my own fashion brand, but that sounds good and err, might focus my (non) sewing skills just a little. Thank you so much for stopping by and having a chat Kelli, another slice of carrot cake before you go? 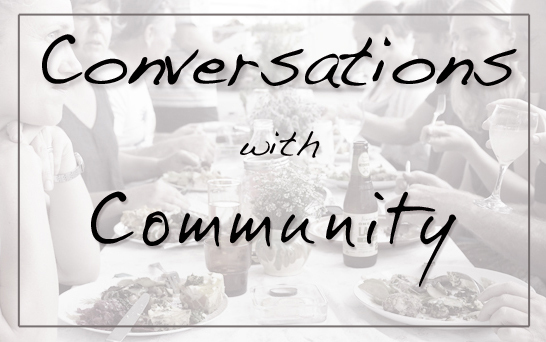 This conversation with Kelli of Pure Pod is the first in a series, Conversations with Community. Whether it’s online or face to face. There will be some wonderful conversations coming up with amazing women, doing incredibly inspiring things within our community. I’m really excited to be able to share some of their stories with you. This entry was posted in Connecting with Community, Going Green, Making, Creating + Frugal Living, Rambles, Waffles and Digressions and tagged australia, Connecting with Community, ethical clothing, fast fashion, kelli donovan, pure pod, slow fashion, sustainable living by cityhippyfarmgirl. Bookmark the permalink. This has been a beautiful Sunday morning read Brydie. I have become more aware of buying ethical, sustainable clothing in the last few years. I am still guilty of occasionally going down the mass produced path, particularly for children’s clothing. All of these clothes look beautiful, thank you for sharing. They really are lovely Jane and they change them up regularly. I’ve got three pieces now and they are hands down my favourite items, being ethically made just makes them 100% even better. I’m so excited by your new “conversations”, this was a great read. Thank you. I’m with you on window shopping, and just hate the way fashion is driven by peer pressure even in the professional setting and I love the idea of slow fashion.. I’m going to hunt out these suggestions now. Thanks Tamara, I’m really excited to see where this new series goes too. There are some amazing people out there doing incredible things. Slow fashion is something that I care a lot about, and Kelli is someone that follows that passion up with really beautiful clothing. Congratulations Brydie. This is a lovely idea and really interesting post. Perfectly-timed too – Sunday morning is one of my kid’s allocated ‘screen time’ slots, so I pulled up some pillows and a cuppa and had a good uninterrupted read. Look forward to checking in again. It’s good to do that isn’t it Saskia, just that solid reading time uninterrupted. Far better than snippets! Thanks for the kind words on my idea too, I’m really looking forward to seeing where it goes. That was really fun and so interesting. Look forward to more talks with peeps doing good things in our community. I had no idea they were in Canberra. I have my eye on the dress that covers arms and legs. Hard to find these days. I love this! Very inspiring, and ehm, I would love to try my hand at making a skirt.. As I get older, slow fashion and owning less has become more important to me – and making own garments (with expert guidance..) would be liberating! This is a fantastic post, looking forward to reading more of your interviews. It’s exciting to hear about a really genuine fashion brand that is ethical. It is such a shame that their are fewer makers in Australia, there are so many Australian brands that have fewer and fewer garments made in Australia. Secret south was a favourite of mine but it just disappeared.